Whether you have a short daily commute, or you’re planning a long journey, having a winter essentials kit in your car can keep you safe and warm should the wintry weather strike while you’re out on the road. There’s nothing worse than having to sit in your car in the cold waiting for the windscreen to thaw and de-mist before you start your journey. An ice scraper and de-icer spray can make clearing your windscreen quick and easy, and you’ll be on your way in no time! Keeping a torch in the glove box of your car is a great idea if you find yourself replacing a lightbulb or changing a tyre at the side of the road, either before or after daylight hours. A strange thing to consider in the middle of winter, but low sunshine in the mid-afternoon can be blinding, so it’s best to have a pair of sunglasses handy. Breaking down in the middle of the night or far from assistance can mean that you’re stranded for quite a while. The temperature inside a car can drop quickly without the engine running, so keeping a bag of warm clothes and blankets in the boot of your car will help you stay warm until help arrives. No matter how careful your planning, if you breakdown you might find that there’s no other option but to walk it. This is not recommended if you’re on a busy road or far out of town, but if you break down or get stuck in the snow close to home, leaving the car and walking home might be the best option. Wearing a good pair of boots will also help to keep you warm if you get stranded, and will keep your feet cosy and dry if you have to dig your car out or change a bulb at the side of the road. Keeping a few spare light bulbs in the car means you don’t have to call for help if a simple headlight blows. Winter or summer, you should always have a first aid kit in your car – you never know when you might be in an accident or just need to clean and treat minor injuries. Cold weather can result in a flat battery, and if your car won’t start it can be hugely inconvenient. Having a set of jump-start cables and a friendly neighbour or passer-by can mean that you can get on your way without too much delay. 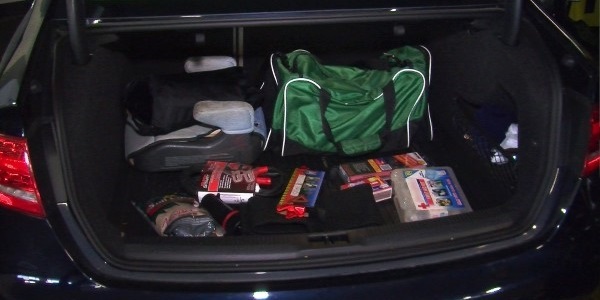 A stash of food and bottled water in the boot can help stave off hunger pangs if you’re stranded overnight, or even just for a few hours. If you need to travel after a snowfall, the most difficult bit is often getting off the drive or out of a car park. Having a small shovel in the car so you can dig out tracks for your tyres will help you get going. A bag of rock salt can also help to give more traction in sludgey conditions. An emergency triangle is a must for all cars, no matter what time of year. But in the winter months when it’s darker or foggy, a well-placed warning triangle is essential to warn other road users of your presence. If your sat nav fails, or your battery runs flat on a long journey, a good old-fashioned map book can help you find your way home. Keep a mobile phone charger in the car for emergencies, so you don’t end up stuck at the side of the road with a flat phone battery and no way of calling for help. It’s always good to check the traffic news for any potential delays during your journey, but in winter, checking the weather forecast and traffic updates before you set off can save you from being stranded in the cold. If you’re looking to hire a car this winter, please contact Caversham Vehicle Hire and we’ll be happy to give you a quote.